Labels both Piscataway and Princeton. 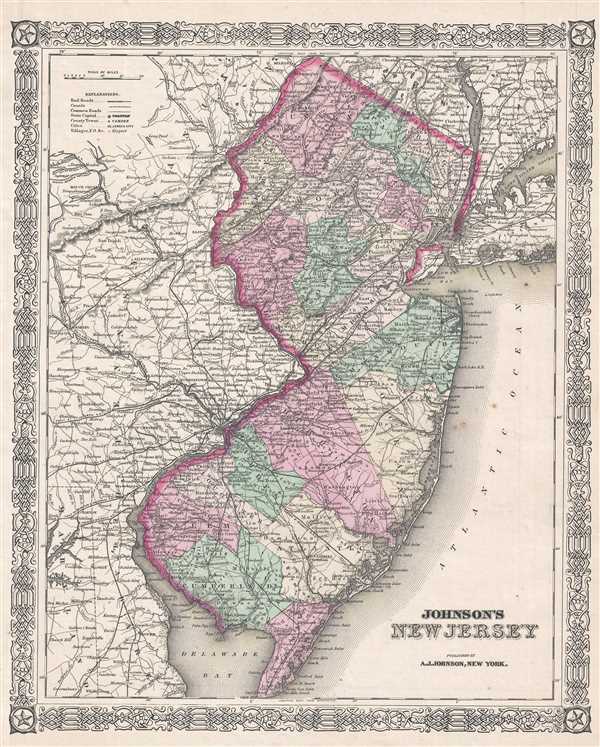 This is an 1866 A. J. Johnson map of New Jersey. The map depicts the entire state along with portions of adjacent Delaware, Maryland, Pennsylvania, and New York. Counties are shaded various colors to allow for easy differentiation. Numerous cities and towns are labeled, including Jersey City, Trenton, New Brunswick, Piscataway, and Princeton. New York City, Brooklyn, Flatbush, Bushwick, Astoria, Harlem, and Staten Island are also labeled. Railways, roads, rivers, and other topographical features are illustrated. The map features the fretwork style border common to Johnson's atlas work from 1863 to 1869.